With one of the best warranties in the industry, we share your pain when a part fails prematurely. We use only factory original parts as a rule, so when a part fails, it is backed by the manufacturer policies for recalls. Rest assured that you will not pay full price for a part that you purchased from us within 5 years. Action Appliance warrants any parts installed on your appliances from the original date of service unless otherwise stated. The original receipt must be retained for proof of warranty. Non-payment of service voids any warranties. Action Appliance will service your appliance on-site, within our normal service area only. At our option, we will repair your appliance with like and/or simiilar parts. If the appliance is serviced by anyone other than Action Appliance, this warranty is void. For the first 90 days, Action Appliance will provide a free on-site service call for your appliance even if the repairs are unrelated to the original service. For the first year from the original date of service, Action Appliance will provide, free of charge, replacement parts only, that fail due to defects. You must pay for the service call and labor charges after the first 90 days. For the second year from the original date of service, Action Appliance will provide a 50% discount off the retail cost of parts that fail due to defects. You must pay for the service call and labor charges as well as the balance of the parts cost. 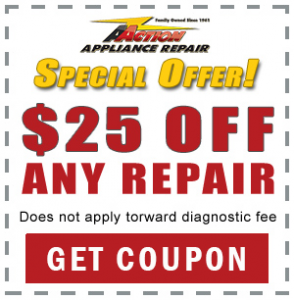 For the third through fifth years from the original date of service, Action Appliance will provide a 25% discount off the retail cost of parts that fail due to defects. You must pay for the service call and labor charges as well as the balance of the parts cost. Improper installation and maintenance by the customer. Replacement of house fuses, resetting circuit breakers or turning on water valves. Failure of the product if it is used for other than its intended purpose, abuse or used commercially. Parts that becomes no longer available from the manufacturer. Normal wear, corrosion, or cosmetic damage and/or other damage that does not affect functionality. Electric or Electronic parts damaged do to short circuits or power surges. Sealed system refrigeration repairs that involve leaks or blockages when the origin of problem cannot be determined. Accurate as of 06-14-2013. Warranty may be modified without notice. Contact office for details or see the back of your invoice. Written copy provided with every repair on the back of the invoice.